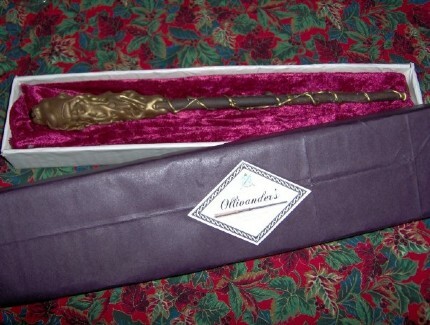 One of the first shops that Harry Potter visited when Hagrid took him to Diagon Alley was Ollivanders, the wand shop to buy his most important possession, his wand. 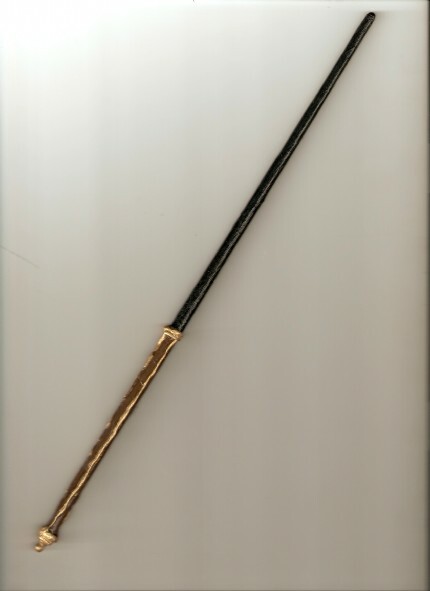 Wands can be made from a variety of materials, after all Hagrid used an old umbrella as a wand! Yours will be made from paper. 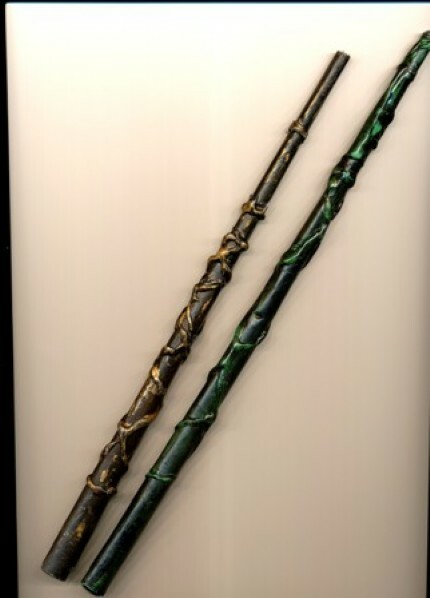 But do not be deceived it will be every bit as magical as the real wands used in the film, and if you make it carefully will look just as good.
. . . Because glue is used on the paper to harden it, this wand is a made of a type of papier mache. 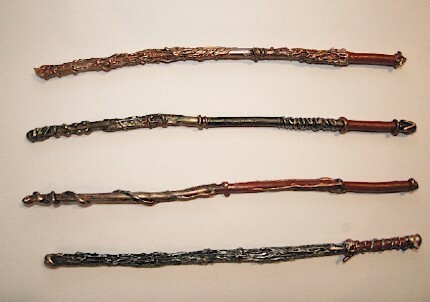 You can paint your want in any colour you want, and the instructions show you how to make you wand look distressed (that is a technical term that furniture makers use to describe the process of artificially aging an item), and really ancient; fit for Harry Potter himself.
. . . 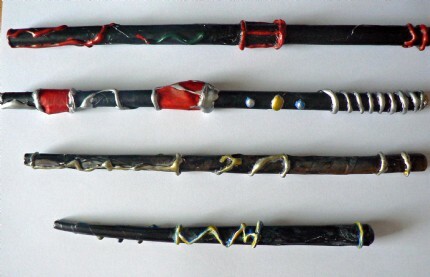 The wand painting is built up in three layers. 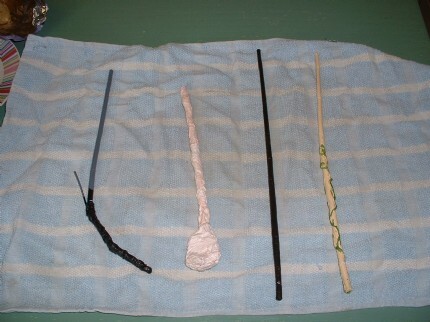 When painting the wand make sure you use paints that dry to be water proof, otherwise the next layer you put on will wipe off the previous layer. Paints you can use are acrylic, decorating emulsion (latex paint, US) and or spray paint.
. . . To create the gold highlights on the detailing you can use a gold felt pen, gold gel pen, gold nail varnish (if you’re careful) or if you want the exact gold effect shown in the photos, then you should use a special gold rubbing paste (I used a product called Gold Finger from Daler Rowney), which frame makers use to make picture frame look golden. 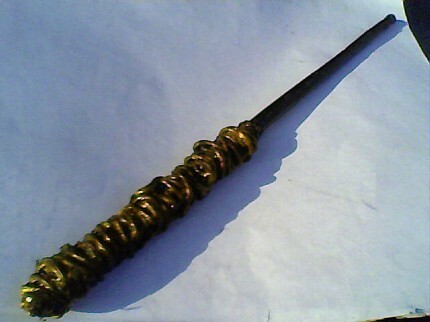 But any thick gold paint will do and you can put it on with your finger, if you’re careful. 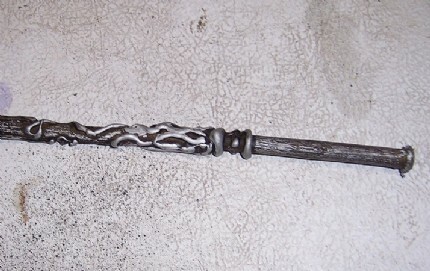 For the really special silver metallic effect I used silver-leaf, you could also use gold-leaf. This isn’t expensive, and is not at all necessary, but it is nice to try it if you have the chance. 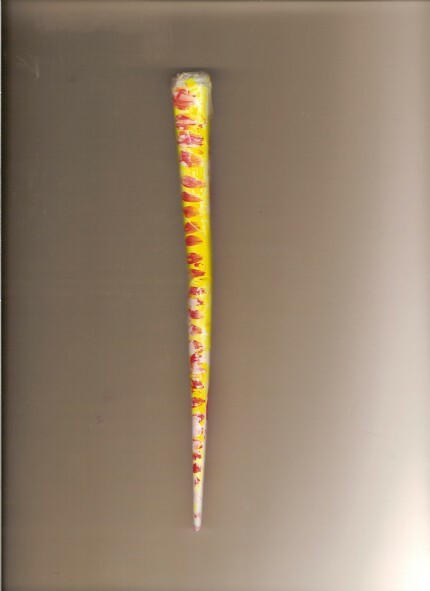 (if you are going to use gold or silver leaf, then ask in the art shop or look on the web for instructions on how to apply it. It’s not hard, but you will need a small pot of gold size (an artists liquid glue that dries tacky).
. . . 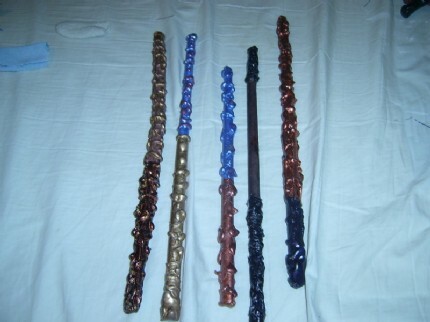 If you don’t have any of this stuff, then you can still make a lovely wand following the instructions, as you can see from the images below and even more in the wonderful wand images in the Your Models section. 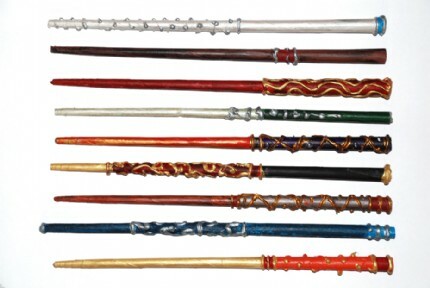 People have used great inventiveness to create their wands, they have used bits of wood or bark to trim then, used string or even cooked spaghetti instead of the glue gun patterning, and all manner of different types of paint and finishes to make their wands unique. For a detailed set of instructions and an explanation of how to do the distressing, which is very easy and great fun, please see the instruction sheet which is available in both A4 and US Letter sizes. Just click on the size you want to download. 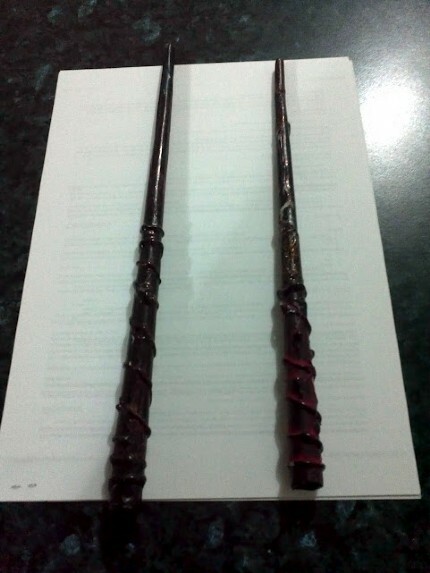 Posted by mdub - Two wands made for my kids. 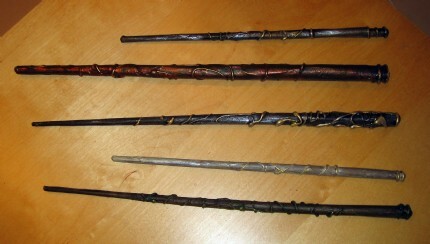 I'll make some wooden ones next time round, as the spell casting, has worn out the paper ones. 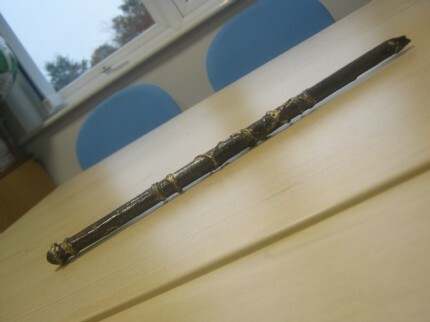 Posted by KarenSmedley - This wand was made at school, we are very proud of it. 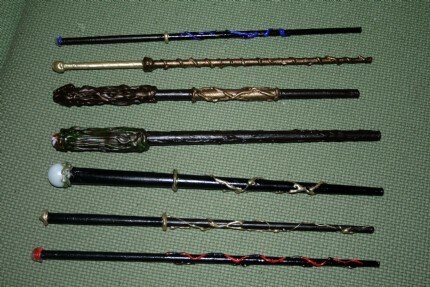 Posted by Adventurer - My sister and I had fun making wands before Harry Potter and the Deathly Hallows 2 came out! 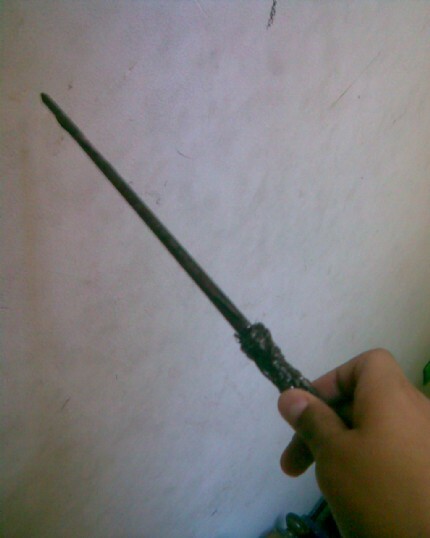 Posted by vhydev - The Wand of Wolfwyck Proprieter( aka me...) JH Rackharrow. Posted by tinascratch - A closer look. 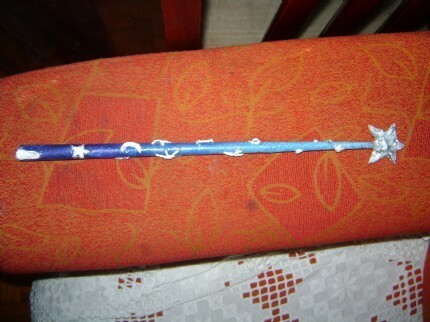 Posted by tinascratch - This wand was made by spray-painting with black first, then painting with nail polish. 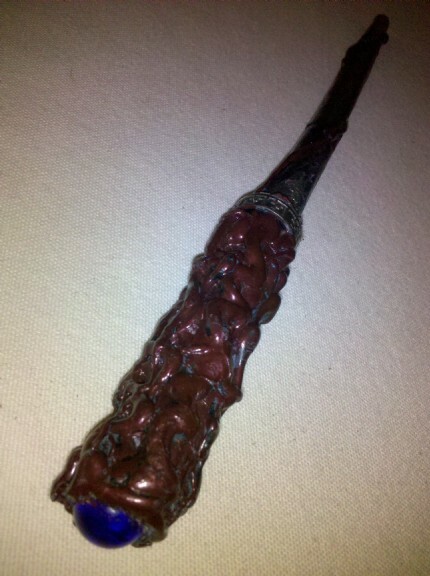 This created a nice underlayer of black that shows through somewhat, especially in the crevices. 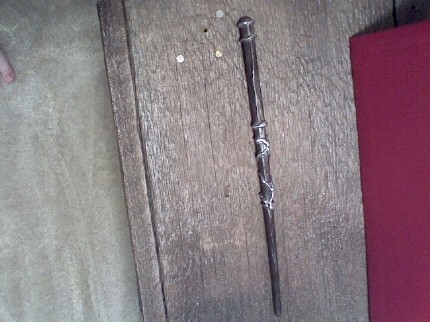 The very end of the wand has a medium-sized blue craft gem. 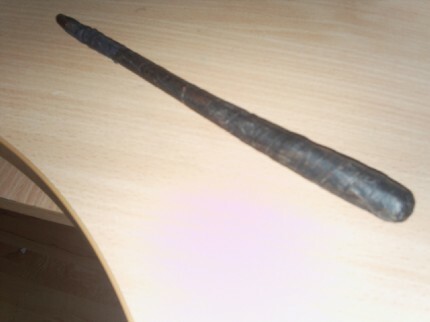 At the midpoint of the wand is an old sterling ring I found that was too large for me but the perfect size to put on the wand as the glue detailing was drying. 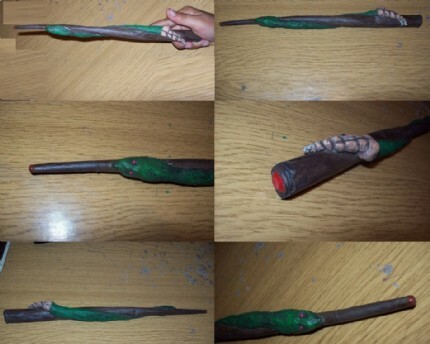 Posted by jinesta1 - My design, a snake wand, the snake was made with paper and glue. 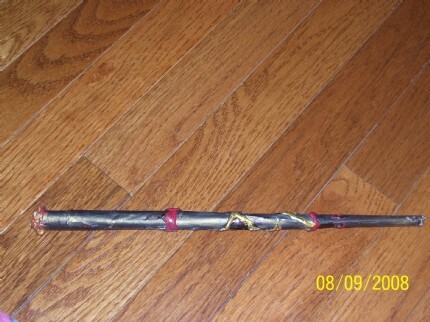 Posted by metasue - This is one of many wands, multiple layer colors and designs... Christmas craft project!!! Posted by adree441 - i had to improvize on this cuz i didnt have enough glue and i still think it looks pretty good, don't you? 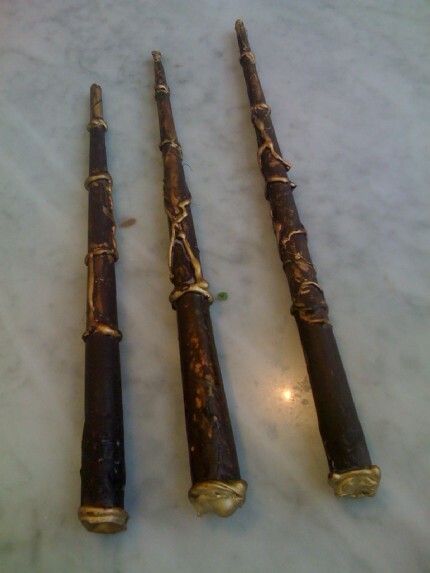 Posted by danub - My boys and I had our first go at wands today. 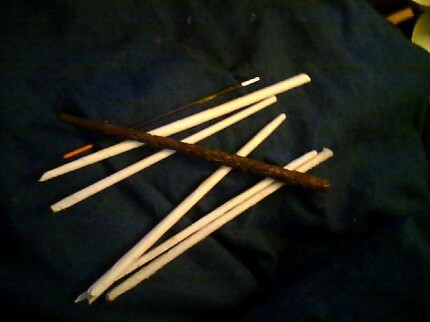 Top is mine red one is Dylans age 5, 3rd is Dawsons age 11 and the bottom is an extra we tried everything first on. 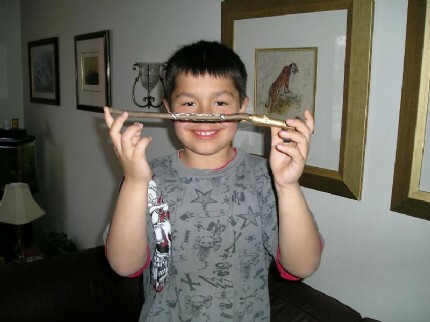 We all had a blast on a rainy day and the boys did all their own painting. Thanks for a great project were all lookin forward to starting some more from your great site. 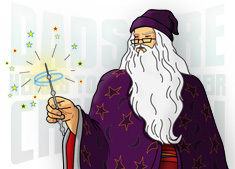 Posted by Stopdroproll - Our favorite project was the wizard wands. We've made several for ourselves and friends and they've lasted a few years! 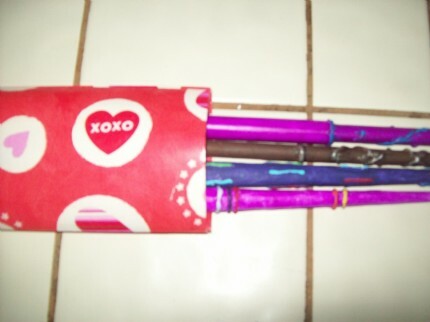 Posted by TwinsisterWendy - It is so easy to make!! We had a lot of fun trying all sorts of different painting techniques.. and we are not done yet! 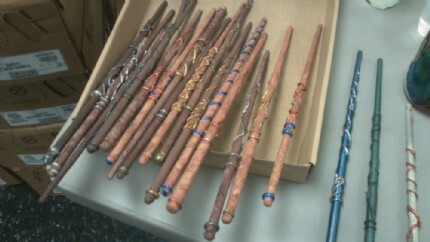 Making one for each Hogwarts teacher we have on our next Harry potter themecamp with the boy- and girlscouts! Posted by ella14 - You can't see it. 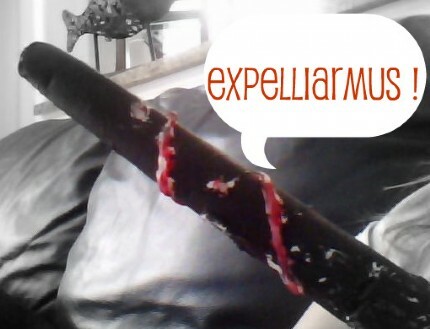 But when you are suppost to fill in the ends with glue gun, on top of the glue i put glow in the dark paint, because i didn't have the requirments for a real lumos wand. But it works just as good. 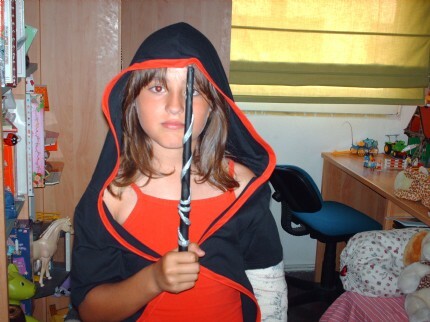 Posted by davidst94 - Grettings from Venezuela!!... 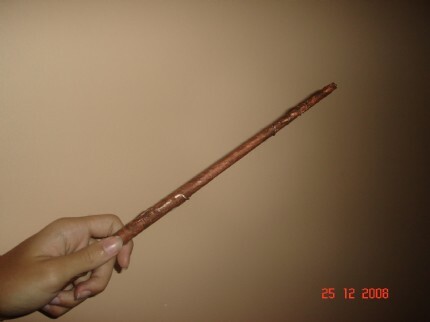 haha... Well i make this following the instructions... and creating my own model... Is based of Hermione's first movie wand. Posted by yoyomax12 - I made an instructional video for YouTube based on the dadcando.com instructions. It is my most watched video. 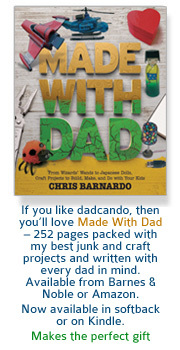 Thanks dadcando!! 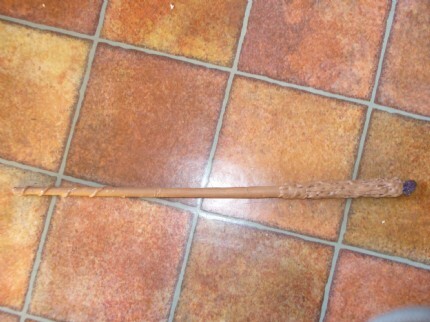 Posted by samule - we bent the handel slightly on this wand and a dded a prong from a plastic party fork to create this wand. Posted by scottswalwell - The kids and I have been busy! 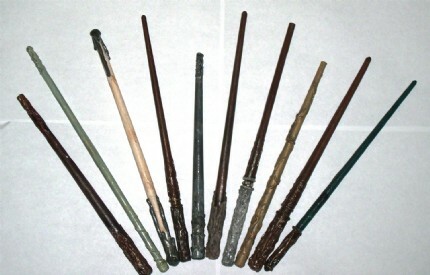 Here's a group shot of our wands. 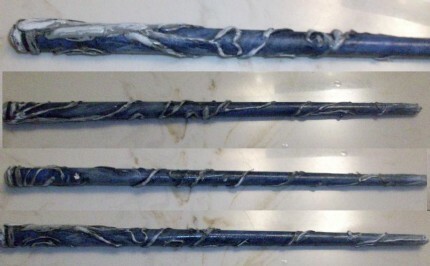 Posted by thorswolf - After doing a few of the paper wands, we decided to try with wood instead. 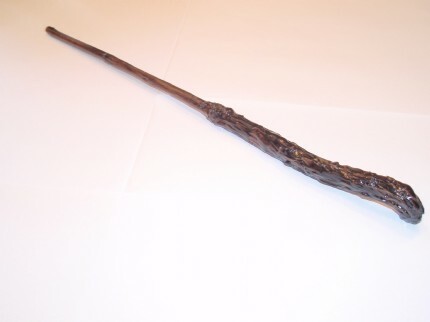 We collected wand quality wood (fighting off a few bowtruckles) and I polished the wood, then treated it with the Dadcando method. 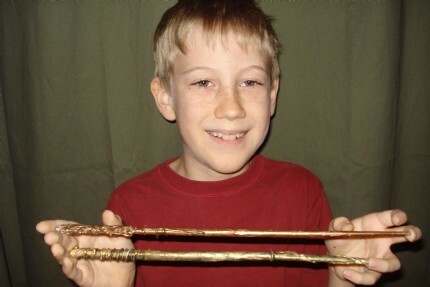 Posted by cable98 - My son and I made these wand and he donated them to be raffled off to help fund our school store. 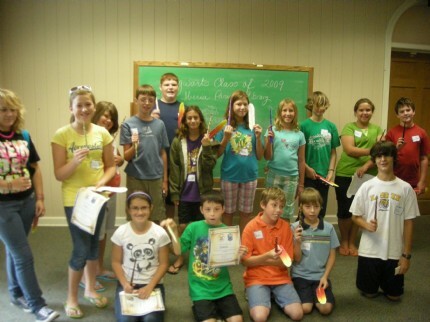 The store, sells items and uses the money to help children who are in need. They purchase school supplies, backpacks and warm winter coats, gloves, hats... whatever a child might need. 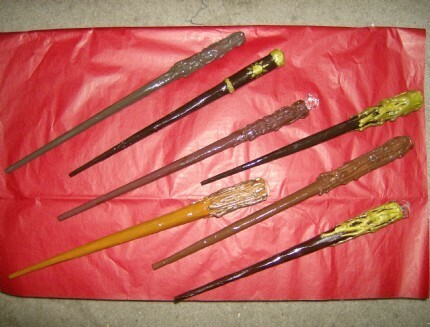 Posted by Silvercloud - I worked my wands a little different. First I started off just like the tutorial. 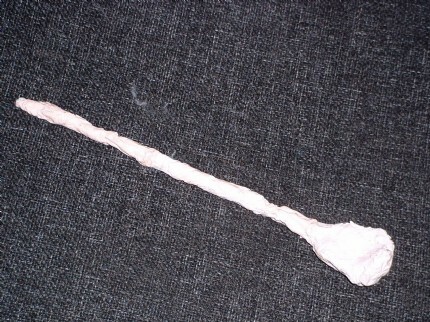 Then I worked with papermache. 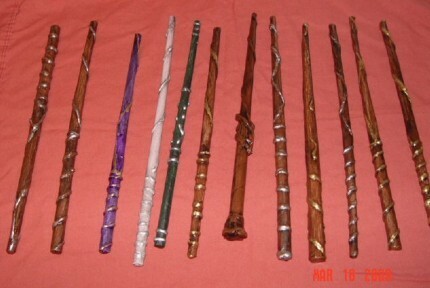 The wands are stuffed with papertowel strips and PVA glue. 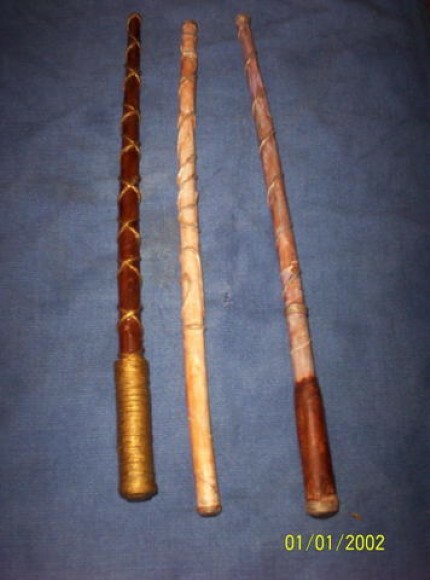 That made them very stabil. 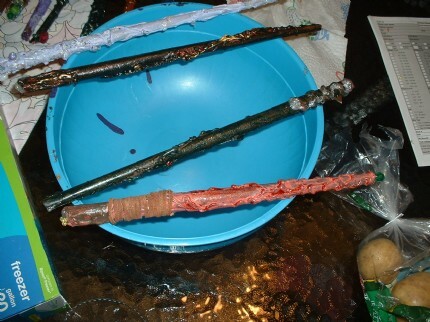 Then I also covered them layer by layer with papermache strips. 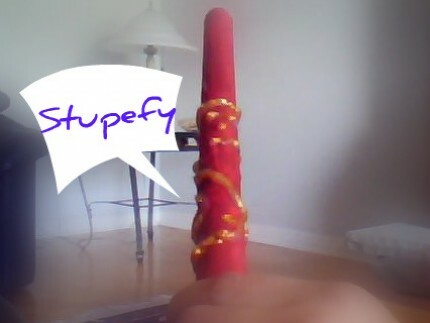 I then worked again with the tutorial using hot glue and different materials. 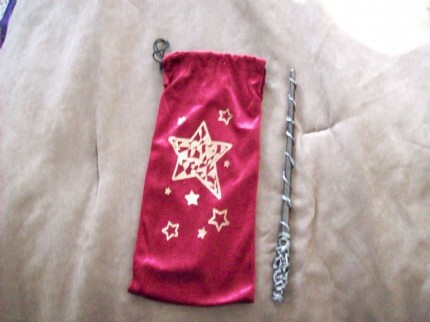 Posted by moonfire - This was my first wand. 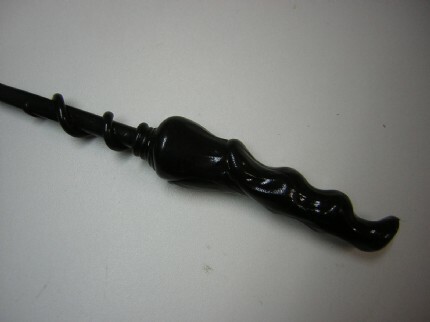 My husband calls it my macaroni-and-cheese wand! Posted by moonfire - This is a great way for us to recycle paper! Posted by moonfire - My daughter requested blue and glitter! 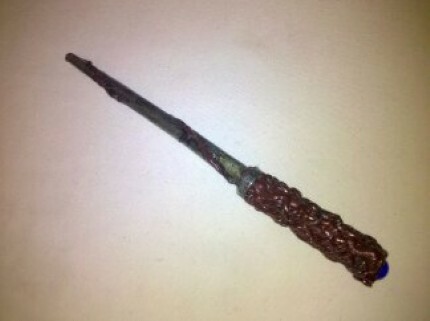 Posted by gourds - This is my wand project. All my pictures are kinda blurry... 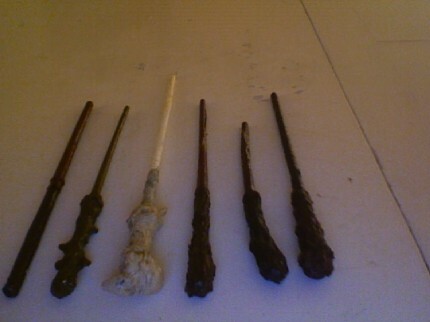 There is a paintbrush, four plain paper tubes, a paper tube covered in hot glue, and my very first wand I ever tried that is a tube covered in hot glue, then painted, then more hot glue, and painted more. I thought it would be different colors but when it dried it just looks brown! Posted by pauljwallace - we adapted the plan by using cooked spaghetti to make the pattern! 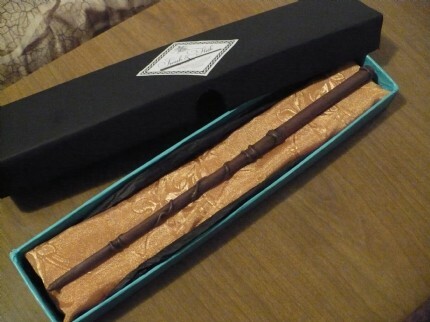 Posted by spoffk - I used the Wand Box pattern to make the box. 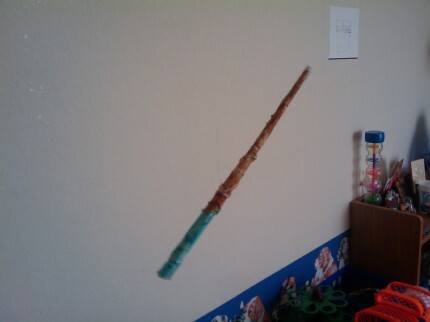 I had some trouble getting the hot glue to go all the way down the paper tube, but it seemed pretty sturdy. 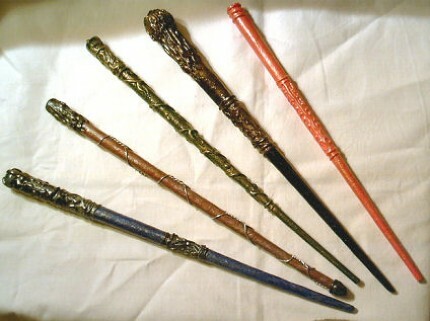 Posted by freetobandito - These are my wands. 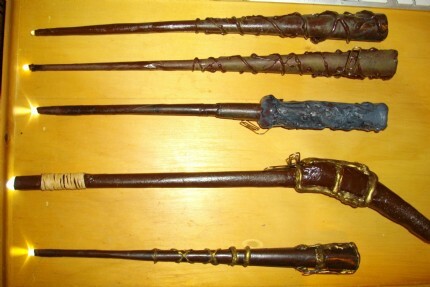 Posted by dragonboy10 - Wands are my favorite dadcando project. 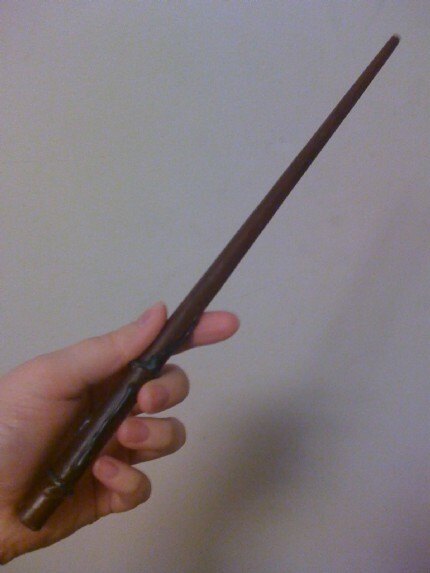 Posted by lpriux - My Wand. 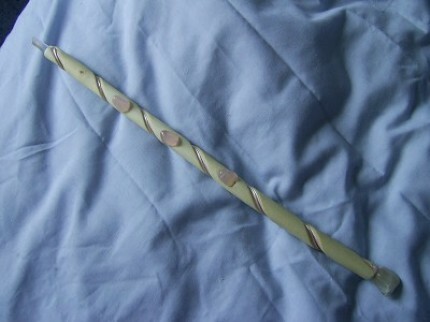 Posted by Galunen - I liked because it was my first! 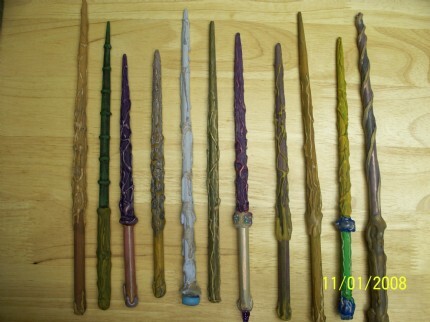 Posted by mustang2044 - To give it a more natural wood texture, I covered the wands in Elmer's wood putty and lightly sanded them down before using glue gun and painting. 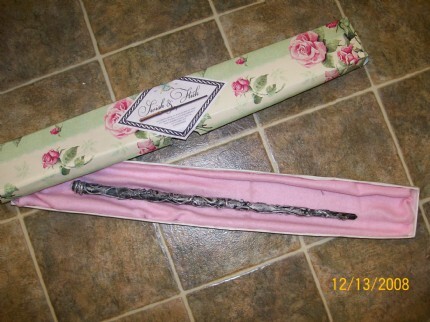 Posted by mimbulus - This is my wand, including the box.. Thanks for the tutorial..
Posted by dramaticdruid - This one is made from just the hot glue, and computer paper. 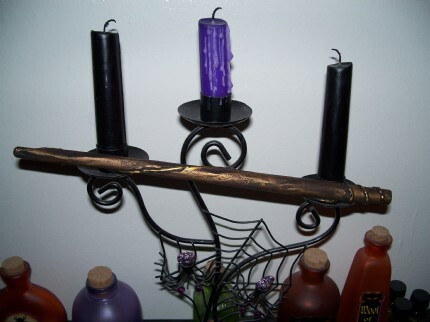 I used markers first black, and then brown to create the wood look and then finished the accents with the rub 'n buff gold patina. 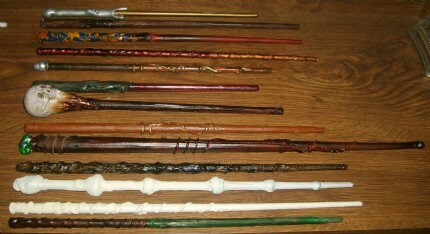 Posted by sallyGrist - here is a pic of a few of your infamous wands that I knocked up over the summer. Posted by fzxguy - What an amazing website! Your instructions are wonderful and easy to follow. 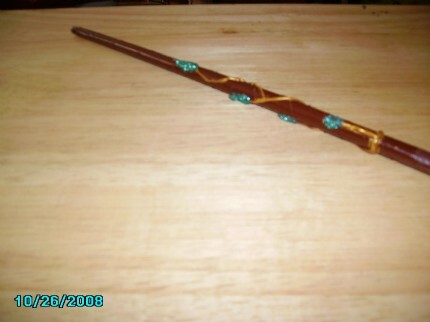 I have almost no craft experience and was able to make this great looking wand and box in a couple of hours. Thanks! 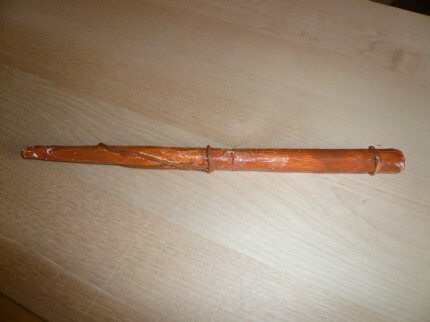 Posted by jedififer - This is the wand I made the other day. With about a day, maybe a day and a half it is really easy to do. I liked the vine look and did the best I could do to recreate one. I used green glitter for the leaves, and gold paint for the vines. 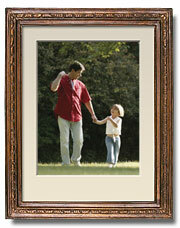 I used a walnut spray paint for the wood look. Posted by bwente - Nice examples! Great for inspiration. 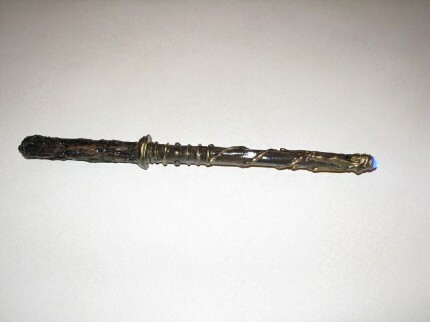 I used a pen that I got as a promotional item, that had a blue LED in it it that lit up when you pushed the top. 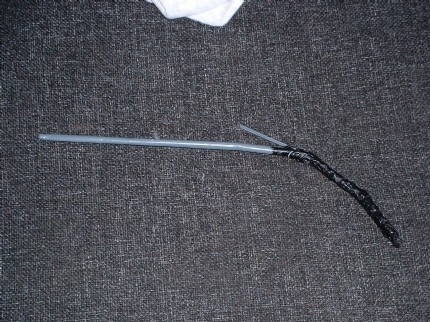 I took it apart and extend the lengths by soldering longer wires to it. 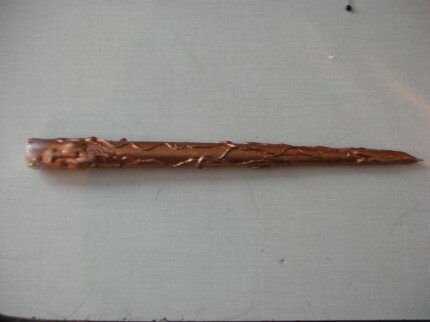 I was able to use the existing battery case and switch in to the bottom of the wand. I had the glue sticks on hand and some left over spray shellac and only had to buy 4 bottles of acrylic paint which I found in the discount bin. 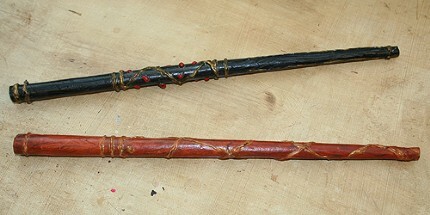 The faux wood/bark effect was made by running the hot glue tip back through the hardened glue. Thanks again, my daughter loves it. 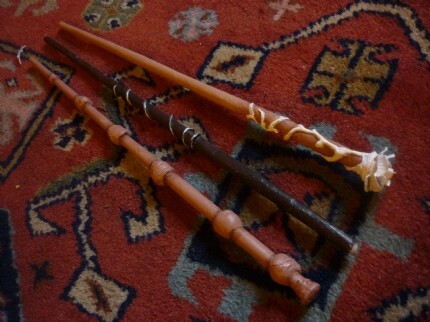 Posted by harrypotter123 - This is my first project on this website. 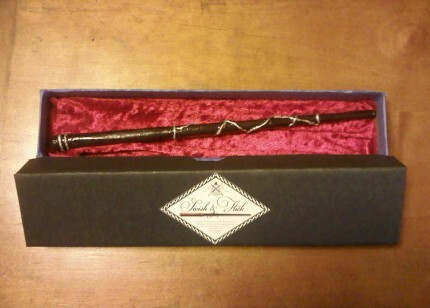 Posted by alyssadelacour - This wand has to be one of my best. 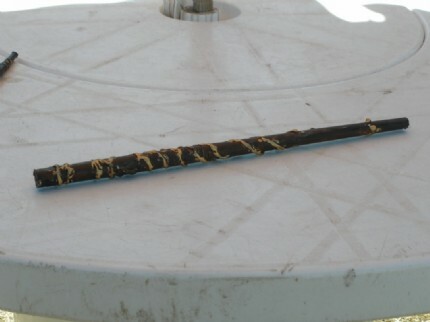 I got the idea for the handle topper ( golden rose) from one of the pictures on here. Like it? I know I do, and to think, it only took me about 45 minutes! 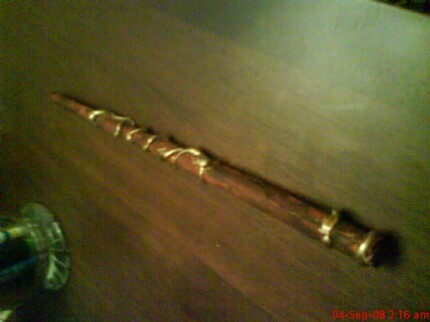 Posted by mylie - I use real wood for this wand. Posted by pixeltrash - These were so easy and fun to make! My 7-yo and I are making a HP tree for Christmas this year and plan to decorate it with all of the great wizard projects from your site! Thanks for the instructions! 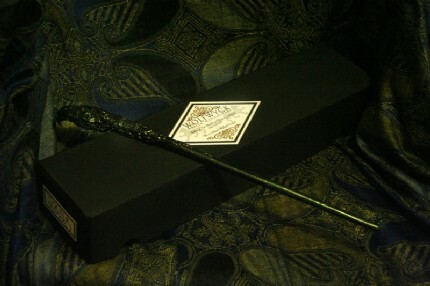 Posted by nepenthe - 2nd wand made which I gave to my daughter's friend for his birthday. 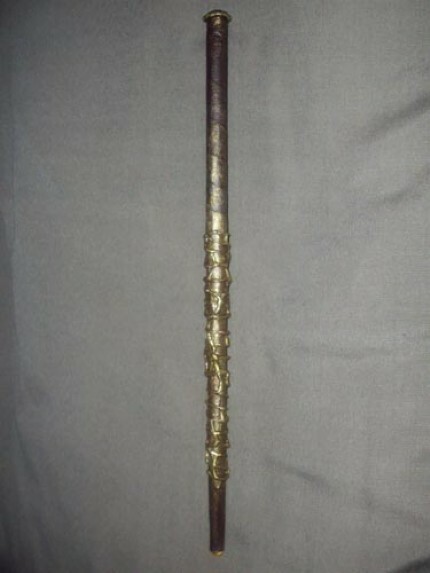 Posted by bitwit - A better look at the handle. 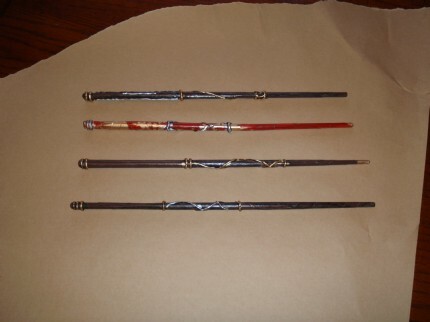 Posted by mattied - The top two I used when I dressed up as a deatheater, and the other two for when I was myself in Gryffindor house. 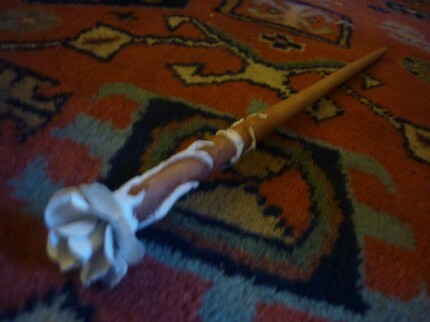 Posted by Sugarplum - The "Flower Wand"
Harry Potter is all done. Of course there are rumours of an eighth book and the fact that we still have two films to go (as the last film will be split into two). 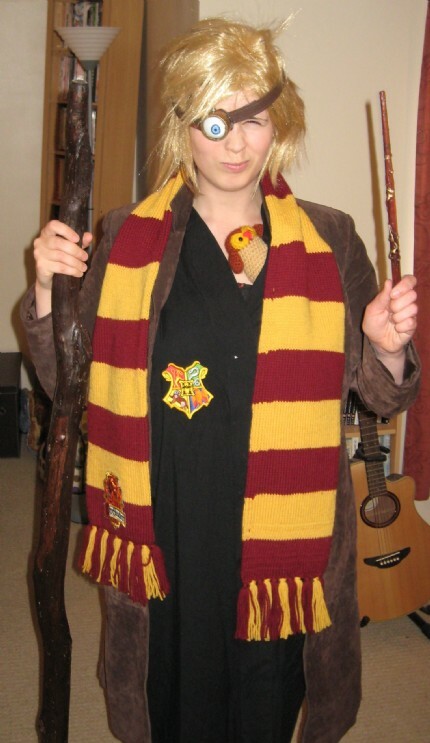 It's going to be a long summer, but November will come round soon enough and the bitter sweet joy of seeing another HP film will be tempered by the fact that there is definitely only one more after that. 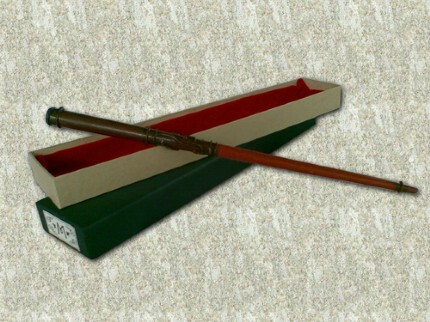 Nevertheless, while you wait, there’s always more than enough magic in the air for you to recreate events at Hogwarts, the Burrow or the Ministry of Magic, by making your own models of Hogwarts wizarding paraphernalia. 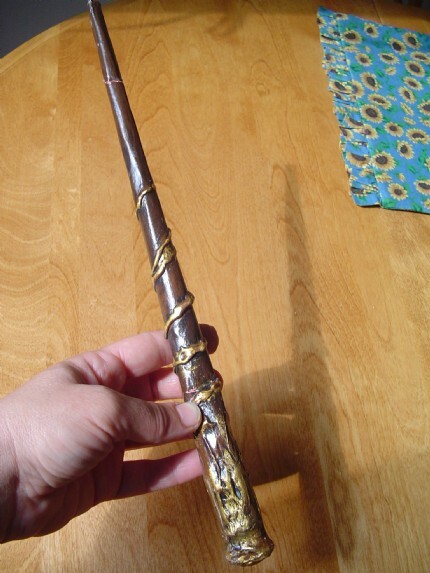 Homemade wizard’s wands, Golden Snitches, or beautiful writing quills and loads of other Potteresk things are all here, ready for you to download on dadcando. 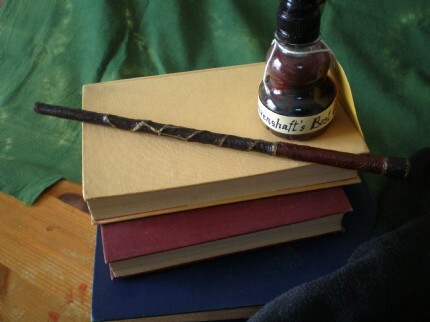 Even if you’re just a muggle and have had enough of Harry Potter, there are plenty of other magical fantasy stories to keep you interested in the Magical Art of Making. All the Chronicles of Narnia are all being turned into films, as are the stories of Lyra in the books of His Dark Materials trilogy. 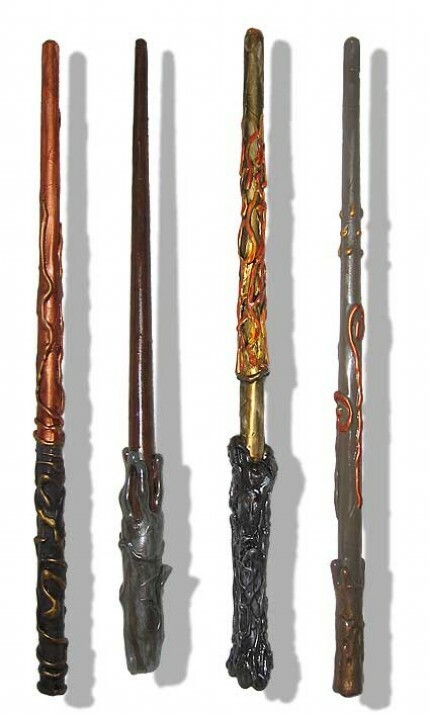 Whenever we see interesting things in these films and stories, we will bring you them as best magical fantasy craft projects, so that you can turn your hand to making magic, and conjuring up some really cool stuff to amaze your friends. 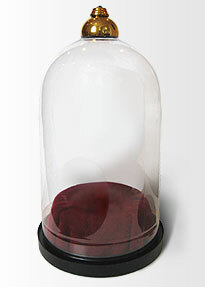 Now you can make your very own Victorian Domed glass display case, from a 2 litre soda bottle, to display all your favourite projects and artifacts really beautifully. With our simple instructions, the results of just an afternoon's making will be really cool, good enough to be film props in fact, and better than anything you can buy, because you made it yourself. 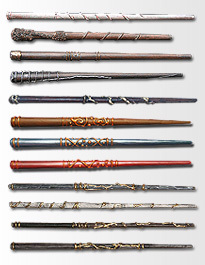 Or why not make a beautiful writing quill from either a hippogryph, phoenix or snowy owl feather . And because no quill would be complete without its own ink pot, there are also some easy to follow instructions and printables, for making the most fantastical, magical Ink-pots.